When running my converted 1436 at speeds of ~22-23mph sometimes it will hop up on the starboard side - almost as if the starboard side is planing the whole way to the transom while the port is not. The weight is balanced perfectly in the boat, it is not favoring one side or the other. It happens while traveling in a straight line and there is no underwater collision that leads to it. My sidescan sonar sending unit runs through the floor and is mounted to the underside of the boat on the starboard side ~6" in from the weld corner seams between the floor section sides and transom. There is a noticeable and unsettling tilt to the whole boat once it happens. If I slow down and drop down off plane and then resume speed its hit or miss whether it will happen again. It never happens the opposite way where the port rides up higher. It will happen with me in the boat alone, or with a passenger including while I have the livewell full of water. Anyone have an explanation as to what's going on? Last edited by onthewater102 on 23 Sep 2016, 15:08, edited 1 time in total. 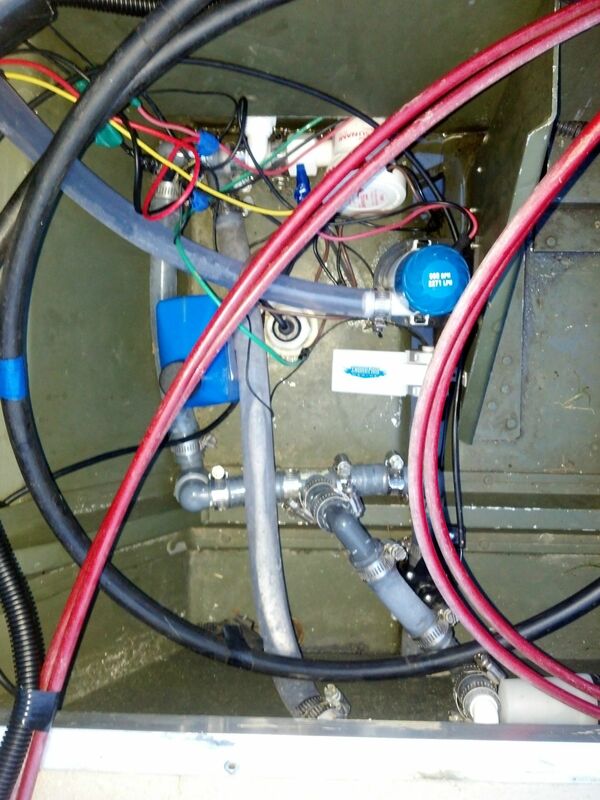 The black post in the center of the image with the white epoxy sealing it is the sensor going through the hull in the back starboard corner. It protrudes as roughly a 3"x6" block that extends ~1.5" deep beneath the boat. But there may also be some air bubbles being formed around that transducer on the right-hand side and whereas air is compressible, but water isn't (although it can be put under pressure), you might have the added issue of the boat 'squatting' in the hole in the water formed where the bubbles and the aeration is forming ... just as a SWAG! I'm sure glad you brought this up. At speed my 15' Klamath pretty much rides on the right side chine. This is a scary situation for me. The boat is relatively light. I figured that the side console and my weight on the right side was the primary cause of this. Probably still is, but good to know there are other factors at work. Triming the outboard might help slightly, but not really enough to make me not want to back off the throttle. I'd have to guess that it is the bubbles off of the transducer that create a smoother path with little drag. I know that some super-fast boats try to introduce bubbles, with rougher bottoms, to help break the adhesion/drag. How about taping a block of wood (fake transducer) in exactly the same place on the port hull and see if anything changes? Maybe some GOOP could be applied to the bottom of the fake t'ducer. That might help it hold temporarily. Right hand drive prop causes the right hand side to lift up? Well, reading other's accounts of "Chine walking" it does sound an awful lot like what I was feeling. Possible solutions include slowing down (uhm...not there just yet), adding a hydrofoil (an option, but not if it's going to slow me below 25mph) and raising the motor (which I believe I need to do anyway as the ventilation plate is dragging - thanx again for that link to the video on proper motor height setting). Not quite sure how raising the motor might help. I bet raising the motor will fix it. You're likely pushing the boat to the limits of that hull design. Mounting the motor higher will keep a little more hull in contact with the water and stabilize it. You might lose an MPH or 2.. but that's the better choice IMO. I think Dale has the answer. You are going too fast slow down!!! If you want the bow rise your seeing glass boats on TV add weight to back 1/3 of boat!! That way your bow raisesbyour happy it'll then lug your engine and burn more fuel!! I'd also make sure the motor is centered and check the skeg. Is it bent? That is why the driver usually sits on the right or starboard side of a power boat to counter the lift from the prop.